Two different variants are available: one with separated source and sink outputs, the other with single output pin and a dedicated pin for Miller clamp function. The EVALSTGAP2S is suitable for both output configuration variants. The device integrates protection functions: UVLO and thermal shutdown are included to simplify the design of high reliability systems. Dual input pins allow choosing the control signal polarity and also implementing HW interlocking protection in order to avoid cross-conduction in case of controller malfunction. The device allows the implementation of negative gate driving, and the on-board isolated DC-DC converters allow working with optimized driving voltage for MOSFET/IGBT or SiC. 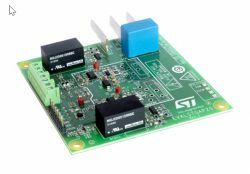 The EVALSTGAP2S board allows evaluating all the STGAP2SCM features while driving a half-bridge power stage with voltage rating up to 1700 V in TO-220 or TO-247 package. The board facilitates the selection and modification of the values of relevant external components in order to ease driver's performance evaluation under different applicative conditions and fine pre-tuning of final application components.